At a very basic level the cosmometry has three primary components: Structural Tensegrity, Flow Process and Field Pattern. These combine to become one unified model, but often we see only one or two of these components at play in a given instance of manifestation. The proposition here is that all three are always present at least conceptually (metaphysically) if not energetically but invisible (i.e. the magnetic field around the Earth), as well as physically. Here is a brief look at these three primary components. Each of them are greatly expanded upon in the Cosmometry 201 section. 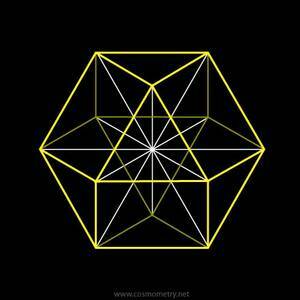 Structural cosmometry is the exploration of the geometric "solids", the forms that comprise the architectural structure of matter and energy. This includes the five Platonic "solids", the Archimedean forms, and the myriad of derivative geometric forms that arise from them through stellation, truncation, combination, etc. Typically called polyhedron ("many faces"), Buckminster Fuller observed that from an energetic-synergetic viewpoint, these structures are more literally the result of the crossing of lines (vectors) of tensional energy (through quantum electromagnetic and gravitational attraction) that meet at what is called the vertex — the points at the corners of a given polyhedron (i.e. the corners of a cube). As such he began referring to them as "polyvertexia" to more accurately describe the geometric array of vertices that truly define the shape of a structural form. This term is used to carry on this useful shift of perspective. One polyvertexia is unique to all of them. It is referred to by two different names: Cuboctahedron and Vector Equilibrium. What is unique about it is that each of the vertices (corners) is of equal distance to its adjacent neighbors as well as to its center point — hence the name Vector Equilibrium, since each vector (edge) connecting the circumference points and each vector connecting those points to the center are all of the exact same length and angular relationship. There is no other structural form that does this (the platonic structures all have equal length circumference edge vectors but shorter or longer center vectors). The "VE", as is easier to call it, is the form of energy when in a state of perfect equilibrium. This, according to Fuller and numerous other researchers following him, is the basic structure of the spacetime field in its zero-point or Unified Field state wherein all vectors of energy are equal both in strength and phase, therefore creating a sum-total of zero. Another unique characteristic of the VE is its ability to dynamically contract and expand in a spiraling pulsation in both left and right-handed symmetry. It is this "jitterbugging", as Fuller called it, that sets in motion, literally, the energy dynamics of spacetime that results in all things manifest. A differential of any sort (pressure, charge, force, spin) shifts the field out of equilibrium — duality arises, a difference can be observed, a relationship is born, nothing becomes something, an entity is manifest. As will be explored in the Cosmometry 201 section, due to this inherent pulsing dynamic the VE can be seen as the "mother" form from which all other basic structural forms are derived. It is the pulsing dynamic of the VE that correlates to the next primary component of cosmometry: the Flow Process of the Torus. 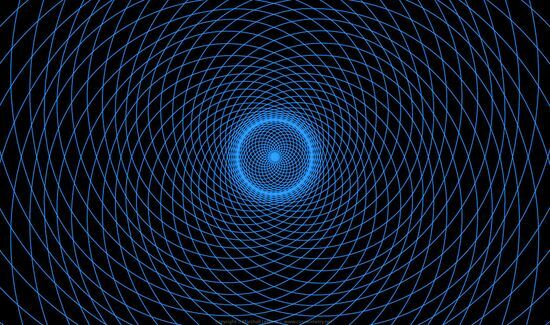 The torus is an energetic flow process that is found everywhere and at all scales throughout the Universe. 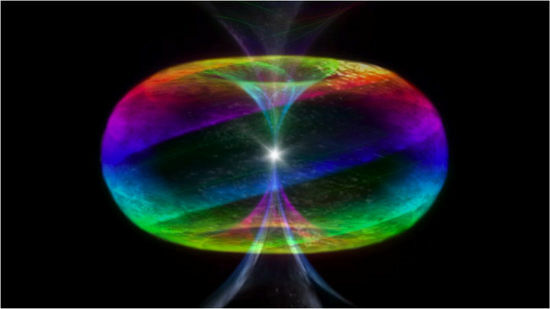 As such, it is the fundamental patterning of all cosmic manifestation from atomic to galactic and beyond — the patterning of all dynamic energy systems when they come into coherence and individuation; the only self-sustaining energy form and the foundation of all sustainable systems. The pulsing, pumping dynamic of the VE creates a toroidal flow, the VE being the energetic "skeletal structure" of a toroidal system. The third primary component of cosmometry is the phi double spiral. A double spiral, in this case, is the pattern created when two spirals (or vortices, more accurately) with spin in opposite directions are overlapping. This pattern is essentially the cross-section of a torus — the pattern of the toroidal field itself. As you'll see, the phi double spiral (and single phi vortex) defines a boundary that demarcates the inside and outside of the specific field system.